Sorry about the lack of posts the past few days. I’m going to have something prepared tomorrow on the conditions that are beneficial to hurricane formation and strengthening. In the meantime I want to run through some of the bigger stories in weather right now. The tropics are finally active! After a boring July we currently have two named storms. Ernesto is currently southwest of Jamaica with winds of 45 knots (50 mph). It’s moving west-northwest at 20 mph and currently forecast to spin close to Honduras before making landfall near the border of Mexico and Belize. I’ll be honest, it’s not very impressive on radar. There’s some areas of heavy rain but it’s highly disorganized. It’s currently dropping a few inches of rain on Jamaica but the impact should be quite minor. We should see strengthen a bit before landfall but it remains to be seen if Ernesto will reach hurricane strength. Here’s NOAA’s 5-day cone. This 5-day cone, produced by NOAA and the National Hurricane Center, shows the forecast track for Ernesto over the next five days. The width of the cone is the margin for error. A shaded circle with an “S” denotes tropical storm strength, a “H” denotes hurricane strength. Florence is still far out in the Atlantic and is falling apart. Shear (a topic we covered in our first post) and dryer air have quickly weakened the storm and there’s little thunderstorm activity remaining. Winds are estimated at 50 mph but even that could be generous. Florence should weaken to a tropical depression overnight and a remnant low sometime Wednesday. In this image a shaded circle with a “D” denotes a tropical depression while a white circle indicates that the storm is forecasted to no longer have tropical characteristics. Meanwhile, here in the states the big news is Curiosity. It’s scheduled to land on Mars at 1:24 am EDT. The rover is about to undergo a series of complex landing maneuvers that will slow it from 12,000 mph and place it on the surface via rocket-powered crane. 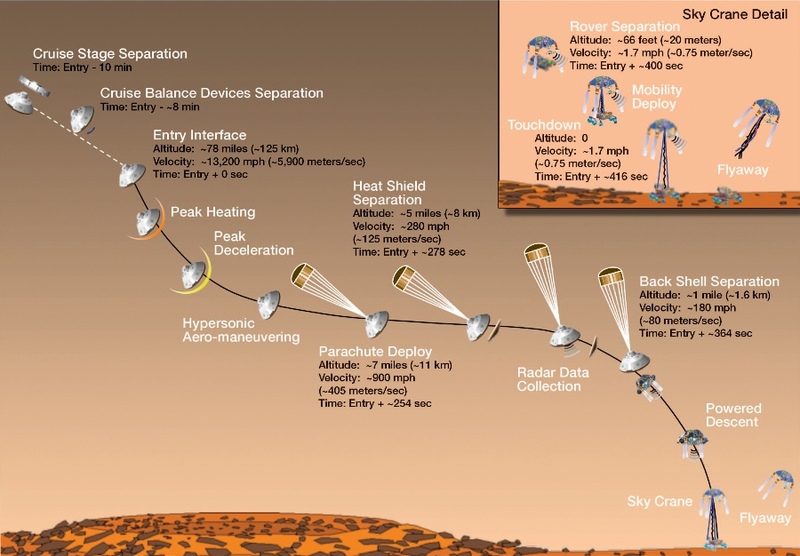 Here is a run-through of the landing process. Once it’s landed the rover will begin searching for signs of life (former or present) and sending back Martian weather reports. I’ll be staying up to find out how it goes, will you?